Greeks are facing the dilemma of whether they want their country to return to the past or to continue on the new path he has taken it on, the leader of Greece’s left-wing Syriza has told his party’s final rally of the election campaign. “Greece will not go backwards. We will move it forward,” Alexis Tsipras told a large crowd at Syntagma Square in central Athens, predicting “voters will say No to a return to the old and corrupt political system” in the country’s second general election this year tomorrow. Mr Tsipras called the snap elections last month after his party split over the signing of a third bailout deal for Greece. In a speech laden with references to struggle, Mr Tsipras said a “strong government mandate” for Syriza was essential to continue the “fight on the European battlefield for a better future for all”, despite the threats and blackmail from certain quarters. The elections in Greece, and those due in Portugal, Spain and Ireland, presented potential to tilt the EU in a “progressive” direction. “Imagine how important it will be if, from this point on, the Greek prime minister in Brussels is not only one against many, but has with him Pablo Iglesias from Spain, Gerry Adams from Ireland and a progressive prime minister from Portugal,” Mr Tsipras told his supporters. In a show of unity by European left parties, Mr Tsipras received endorsement from the leader of Spain’s Podemos. “Podemos is with Alexis! The vultures want to devour Greece, but Alexis will stop them,” Mr Iglesias told the rally ahead of Mr Tsipras’s speech. Gregor Gysi from Germany’s Linke party and Ska Keller, a German Green MEP, attended, as did French Communist Party leader Pierre Laurent. Of the 11 polls published on Thursday and yesterday, nine put Syriza ahead, one had New Democracy in the lead, and one was a tie. 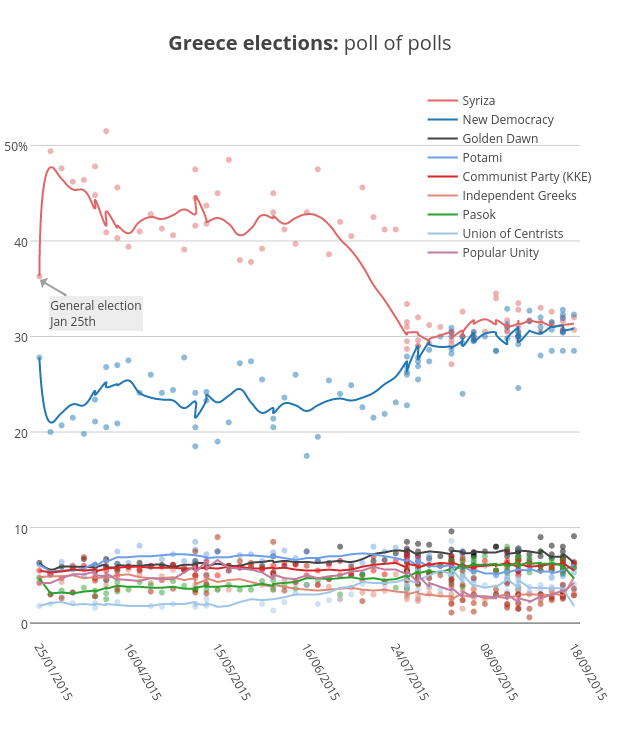 A GPO poll for the country’s largest private TV channel, Mega, put Syriza in first place on 28.5 per cent, 2.5 points ahead of New Democracy, on 26 per cent. In third place was Golden Dawn (6.1 per cent), followed by Pasok (6 per cent), communist KKE (5.7 per cent), Potami (4.8 per cent), Popular Unity (3.9 per cent) and Independent Greeks (3 per cent). As Greece’s electoral system awards a bonus of 50 seats to the first-past-the-post party, on the basis of this upwardly optimistic poll, Syriza could be returned with 139 MPs, or a dozen short of a majority in the 300-member parliament, followed by New Democracy with 81 seats, Pasok 22, Golden Dawn 19, KKE 18, Potami 12 and Popular Unity nine, with Independent Greeks and the Union of Centrists failing to garner the 3 per cent necessary to enter parliament. The scenario of Independent Greeks, which was Syriza’s junior coalition partner, remaining outside of parliament would be a heavy blow for Mr Tsipras, as it would force him to consider other parties. Syriza splinter Popular Unity, which has the support of 25 MPs elected for Syriza last January, could also be in trouble, many polls suggest. But a last-minute endorsement by Yanis Varoufakis, Greece’s mercurial finance minister who stepped down over the bailout deal, may help it over the line. It is also unclear whether the idiosyncratic Union of Centrists would make it into parliament for the first time on its ninth attempt. Many observers believe a coalition involving at least three parties is almost inevitable. “It’s unlikely that two parties will be enough. Recent history shows that the rigours of implementing the bailout led to a steady erosion of parliamentary seats, to the point that new coalitions or elections are needed,” said Nick Malkoutzis, editor of political analysis website Macropolis.gr. The new government faces the tall order of implementing a raft of commitments in October agreed by the previous Syriza-Independent Greeks coalition to secure a third, €85 billion bailout loan from its creditors.